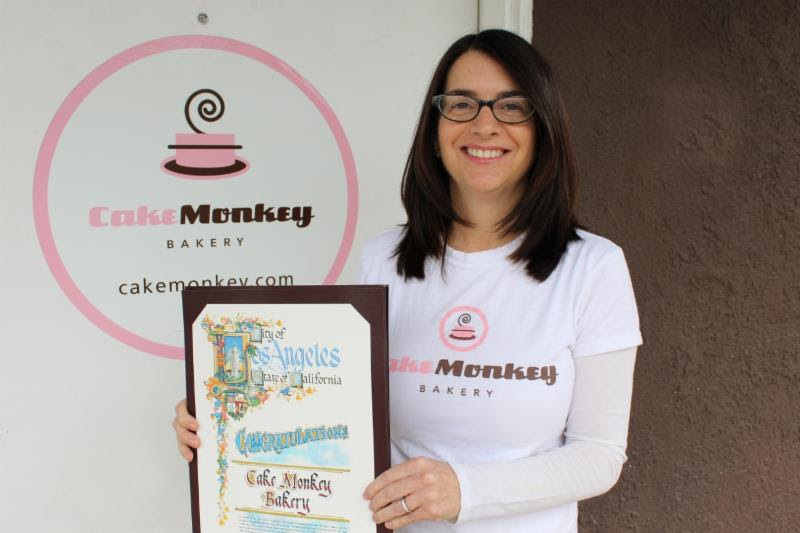 NORTH HOLLYWOOD - Lisa Olin and Elizabeth Belkind are the masterminds behind sweet shop Cake Monkey Bakery. From their North Hollywood commissary, the bakery duo has been dishing out pastry wonders and treats to LA residents since 2008. When Lisa decided to bring her passion of cakes, baked goods and unique desserts to the masses, she partnered with Elizabeth, a pastry chef, to add whimsy, creativity and delicious taste to the delectable desserts. The two have created amazing recipes, from the freshest ingredients and re-imagined many childhood favorites. "I love sweets and cakes," Lisa told Our Valley News. "I wanted to create a bakery that was full of all the things I couldn't find anywhere else -- a gourmet version of my childhood favorites like ho hos and ding dongs, and pop tarts, so that's where the idea came from." The bakery rapidly grew from its humble start to its current industrial kitchen and warehouse located in the heart of the NoHo Arts District. From breakfast pastries to cakes, snack treats and cookies, Cake Monkey produces more than 1,000 baked products a day for a bevy of retail consumers and wholesale clients, including Williams-Sonoma, Nordstroms, Umami Burger, Silver Lake Wine, Cafe Vitta and many more, in addition to serving several locations in Orange County and the Bay Area. If you're having trouble choosing among all the tasty treats Cake Monkey has to offer, Lisa suggests the chocolate caramel mini layer cake, a chocolate brown butter cake with housemade caramel, sea salt, dark chocolate buttercream and carmelized rice krispies or El Rollo, a gourmet twist on a ho ho made with chocolate cake rolled up with vanilla cream and coated with bittersweet chocolate. Last month, Cake Monkey officially opened its first storefront location on 7807 Beverly Blvd., Los Angeles. The bakery caters for all occasions, takes custom orders, and delivers as well. Visit www.cakemonkey.com for a look at all the treats.